Santa can’t do it alone! These varied and exciting Characters roam the Park throughout the year. From Celwyn’s Storytelling to Jack Frosts’ antics, there’s always something happening! Santa met his best friend, Arrow the dog, in the Northwoods hundreds of years ago after he crash landed. Arrow helped Santa find his magic key that was stolen by Jack Frost. Since then they’ve been the best of friends. Soon after that day Santa set up his workshop in the Northwoods and then eventually crafted his very own place where people could come visit him. He called it, Santa’s Village! Now people from all over the world can come and visit Santa right in his own home. Mrs. Holli Claus is a wonderful lady who is constantly working with the Elves of the Northwoods to ensure a smooth holiday season. She oversees toy production, baking schedules, as well, she likes to see all the Elves in a tidy uniform. Her passion above all of that is having high tea with many of the Guests that come to Santa’s Village. On certain days you can join her during the holiday season for a fun filled gathering of dress up, stories and good eats. 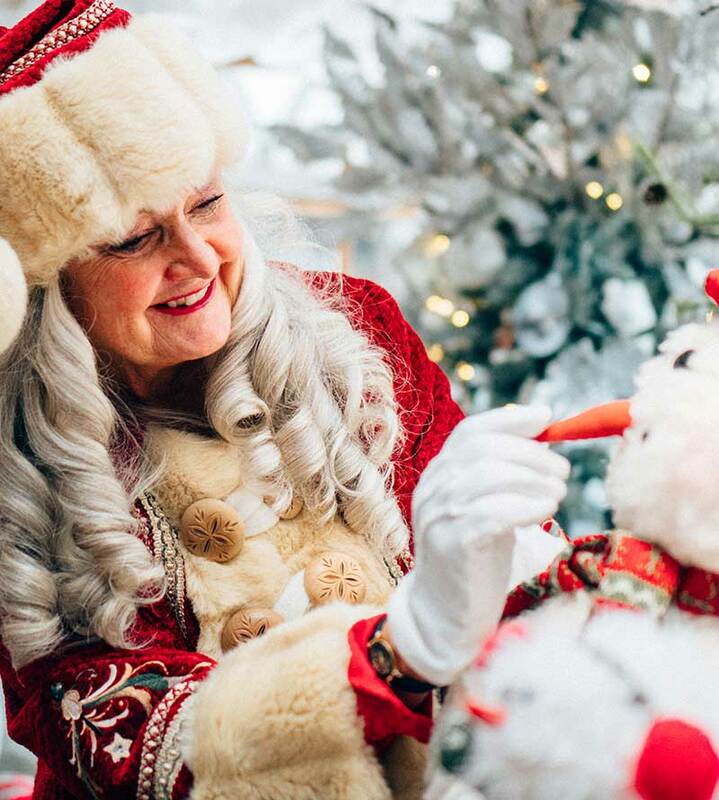 Mrs. Claus has the most fabulous collection of tea cups and tea pots for these special occasions. She will serve a variety of teas, tea sandwiches, and special treats all prepared in your honor! Holli and Santa met many years ago around the time that Santa’s Village was being built. In fact it was Mrs. C that came up with the idea to call it Santa’s Village after names like “Northpole Land”, “The Elf Farm” and “Jolly Toy Making Place” were thrown out. We all thank you for that Mrs. C! 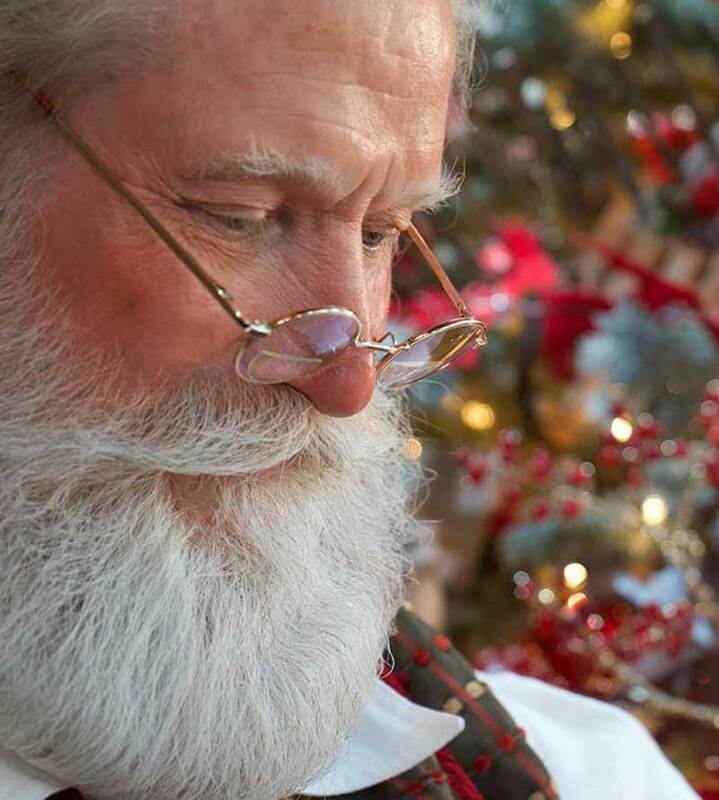 Then Santa came up with the idea to open an expanded Adventure Park with mountain biking, hiking and other activities. 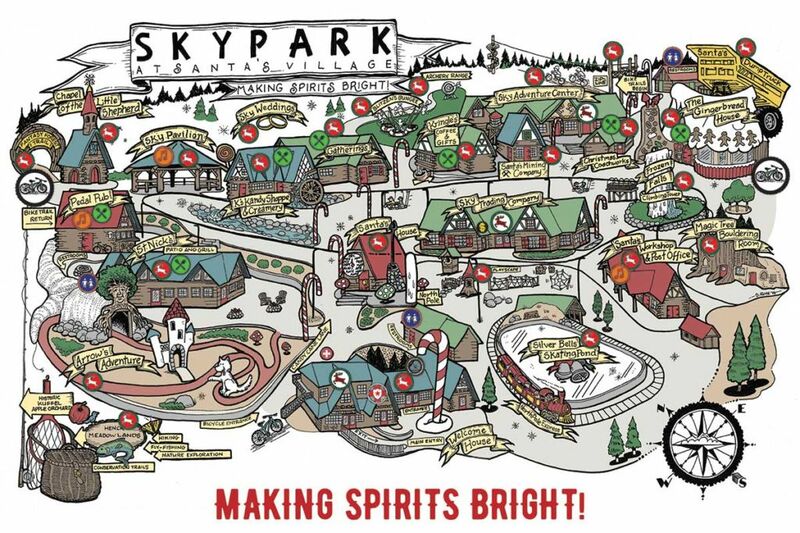 It was again Mrs. C that came up with the name SkyPark at Santa’s Village. She is a very smart and crafty lady. Arrow the dog, is the guardian of the Northwoods and Santa’s most trusted companion. Long ago, on a foggy and blustery Christmas Eve, Arrow was roaming the Northwoods when he saw a bright flash of light and a falling object from the sky. Arrow, confused, noticed a jolly laugh and the sound of bells coming from the object. Santa looked over to the puppy, excitedly climbed out of his sleigh and asked him what his name was. Arrow moved forward with caution and howled, “Arroooooooow!” And that’s how Santa learned his name was Arrow. Santa instantly fell in love with the dog and they had an adventure to find Santa’s missing magic key! Santa brought the trusted dog home to Santa’s Village. Mrs. Claus immediately fell in love with him as well. Arrow has grown to become an independent spirit who demands respect but remains the playful pup that Santa discovered in the woods. 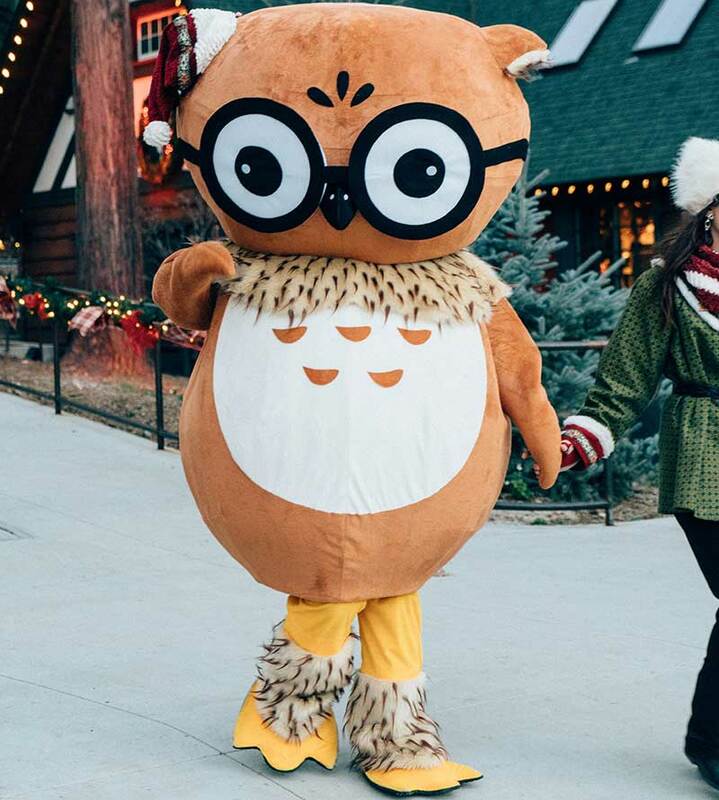 Arrow is easily the most loved creature in all of Santa’s Village, which is probably why you can find monuments of him wherever you travel in the Northwoods. No one in the Village can resist his friendly demeanor and kind little soul. He absolutely loves greeting guests and making new friends. 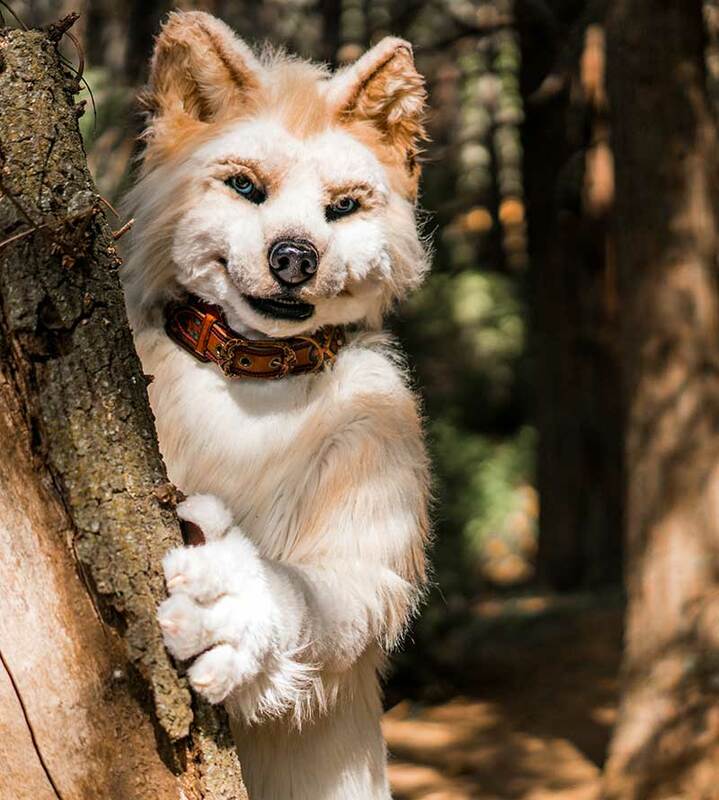 You can find him roaming around the Northwoods with Princess Evergreen, trying to connect with as many new friends everywhere he wanders. King Celwyn Claus, Santa’s little brother, is the Elven King of the Northwoods. On his 21st birthday, Lord and Lady Winter, his parents, announced that they would like to crown a king to watch over the Northwoods. They decided that whoever could woo the heart of Princess Wysdom, who had been promised the Northwoods, would receive the title of King. Celwyn saw this as a fitting challenge because he had been in love with the princess for years. He won her heart and soon married her. Since then, Celwyn and Wisdom have looked after The Northwoods as King and Queen. Celwyn loves spending time with his family, whether he is reciting poetry to his wife or singing songs with his daughter Evi. The Elves have always known King Celwyn to be a kind ruler and always carries a jolly spirit, just like his big brother. The King and his family ensure that their forest home is always in tip top shape, especially when Santa invites guests to the Northwoods! Celwyn loves having guests over and always wants to keep the forest beautiful. He and Queen Wysdom are wise in the ways of forest care and believe that every creature in the forest, no matter how small, is an essential part of the eco-system. 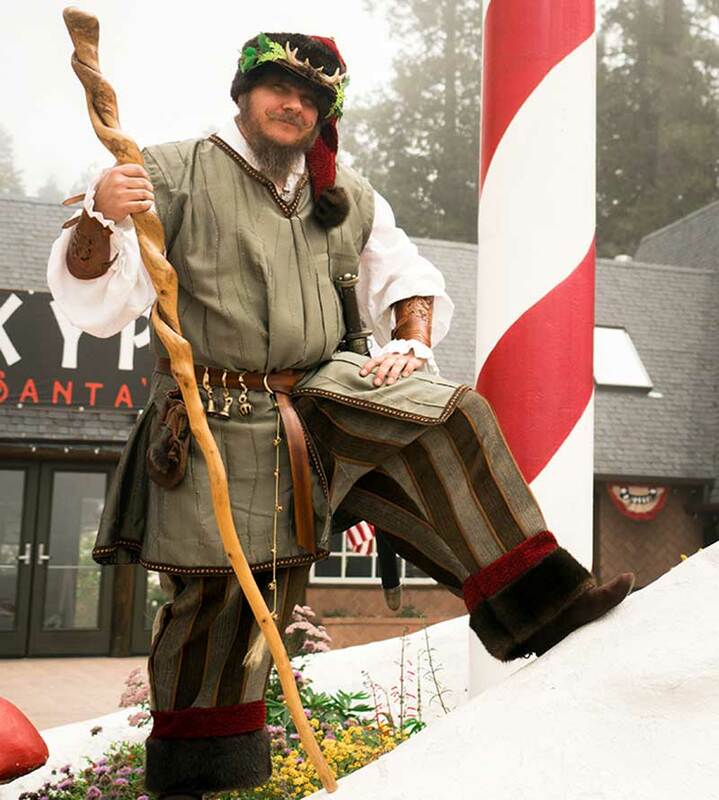 King Celwyn plays a lot of other important roles in Santa’s Village. 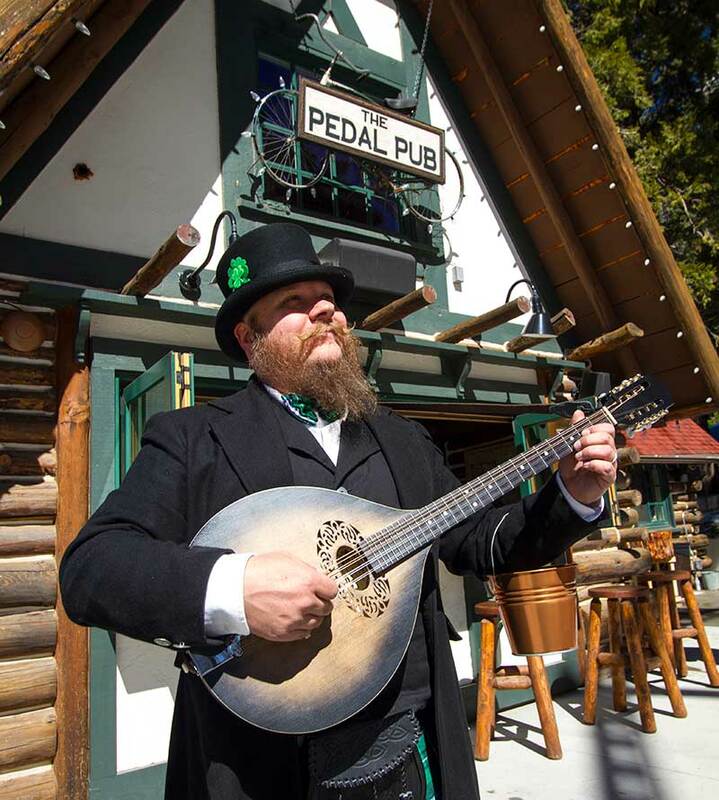 He is the Keeper of Stories of the Northwoods, which means you can find him telling stories in the Village about all of our wonderful characters. Other times you can find him singing a song with one of the princesses. On very special occasions, the King of the Northwoods will perform a Knighting Ceremony where guests can become honorary Knights of the Northwoods! Queen Wysdom Claus, wife to King Celwyn of the Northwoods and mother to the beautiful Princess Evergreen. Wydsom came to the Northwoods many moons ago from the far northern reaches of the Kingdom of Borealis. Her father, had promised her the land of the Northwoods to rule over when she was very young. She had visited the Northwoods every winter since she had been born. Prince Celwyn won over Wysdom’s heart. They were married and crowned King and Queen of the Northwoods. Soon after, Wisdom gave birth to a beautiful baby girl; Princess Evergreen, or Princess Evi as we all call her. When the Queen not spending time with her family, she spends her day harvesting herbs from the forest to use as medicine. She feels it is her duty as Queen to improve the lives of those who live in the Northwoods. She runs her own apothecary; a place where the Elves can pick up medicine when they are feeling ill. She cares very much about the Elves, making sure she never neglects to meet all of their needs. Wysdom loves to help King Celwyn watch over the well being of the entire forest and its eco-systems. Princess Evergreen, or Princess Evi, as her friends and family like to call her, was born to the King and Queen of the Northwoods on a beautiful morning of the first day of Winter. She was born with a full head of hair that was as red as poinsettia leaves – her mother Wisdom’s favorite plant. The King and Queen named her Evi after the Evergreen trees that cover the landscape of the Northwoods. She learned everything about the nature within the Northwoods from her mother Queen Wysdom. Just after her tenth birthday, on a very special Christmas morning, her father King Celwyn bestowed a great gift upon her. 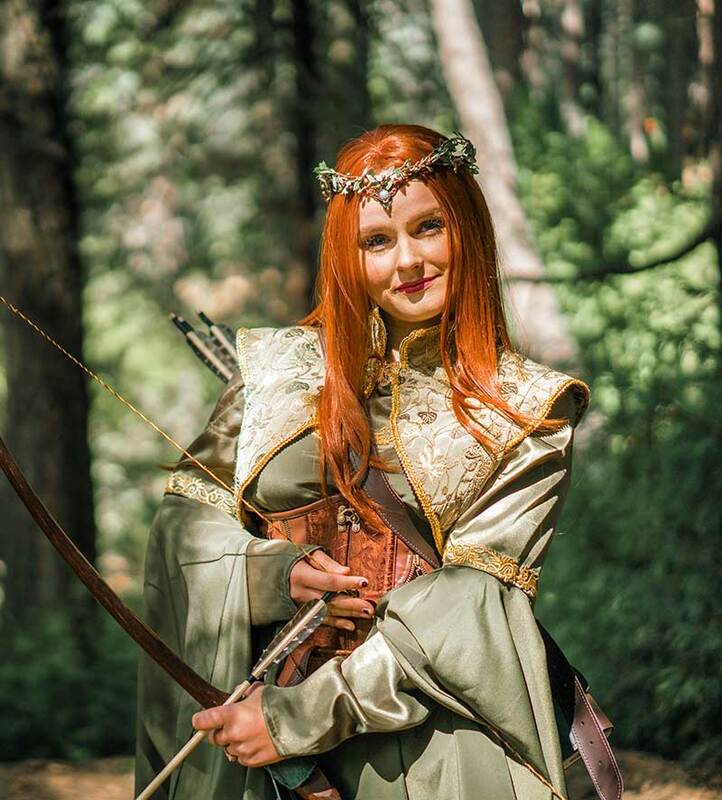 He gifted her a bow that was handcrafted by the Woodland Elves. Evi was so excited that tears of joy flowed down her face. The Elves named her bow “Hollyfrost.” Soon, Princess Evi and Hollyfrost became one. They were inseparable. Evi trained with her father night and day. She soon became a master hunter, ranger and Guardian of the Northwoods. Santa put Princess Evi and his trusted pup Arrow, in charge of being Guardians of the Northwoods. They both love being out in the forest scouting and patrolling. Although Princess Evi is fiercely protective of the forest and its creatures, she is also very excited that Santa has invited families to come enjoy his adventure park. Santa and the Elves build Princess Evi new arrows every year and she is always so grateful. She loves her home and tries very hard to make it as fun as she can for all the children and their families who come to visit. Princess Kandy Sugarplum or Princess Sugar as her friends like to call her, was born to King Heath Sugarplum and Queen Pixie Sugarplum who rule over the Land of Sweets, a remarkable place that is just a hop, skip, and a jump from the North Star! Queen Pixie is Santa Claus and King Celwyn’s Sister! So that makes Princess Sugar Santa and King Celwyn’s niece. Princess Sugar and the Elves from the Land of Sweets play a very important and tasty role in spreading the holiday spirit and Christmas cheer. Growing up, her favorite pastimes were helping Queen Pixie create delicious goods and tending to her candy garden. 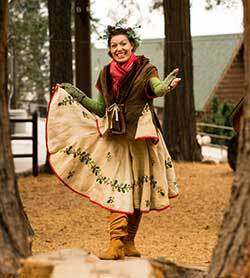 These pastimes have followed her throughout her youth and now she loves to share these pastimes with the Elves and Santa’s guests. 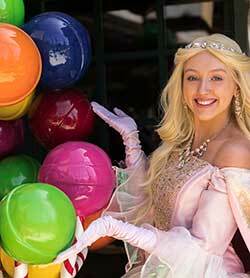 You might find Princess Sugar at K’s Candy Corner at the Sky Trading Co. in the Village. One of her favorite things to do is to learn and collaborate with the candy Elves as they develop new and tasty inventions for children all over the world during the holiday season. She always has a kind word or a special song to share with all of her friends around Santa’s Village. She is known as the sweetest princess in all the land and looks over the candy Elves from the Land of Sweets. She makes sure they are on top of their game when helping Santa deliver Candy Canes, Sugar Plums, and all sorts of other special treats to Good Girls and Boys. Princess Sugar is very sweet to the elves and loves to encourage sweetness toward each other. The candy Elves are some of her best friends. She confects happiness to all the children with her bright smile and rosy cheeks. Her sweet energy is contagious around the Village. Guests can’t help but to smile whenever she is near! CJ Kuffelbug has lived in the Northwoods for a very long time. 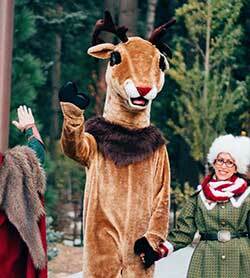 In fact, CJ Kuffelbug has been calling the Northwoods her home since before Santa and his brother King Celwyn arrived in the forest. Rumor has it that the Kuffelbug family used to rule the land until Lord and Lady Winter discovered the Northwoods. CJ is Santa’s beloved Elven friend and the official ambassador to the Elves. 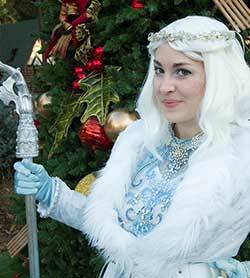 She comes from the highest rank of leaders and helps Santa and the Elves plan out all of the activities around the Village. CJ loves to get everyone around the Village as involved with each other as they can. 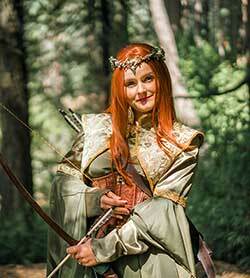 She promotes camaraderie, not only among the Elves, but among guests too. CJ Kuffelbug spends a lot of her time teaching guests about the nature of the Northwoods. CJ’s favorite area of the Village she likes to share about is the Fantasy Forest Trail. 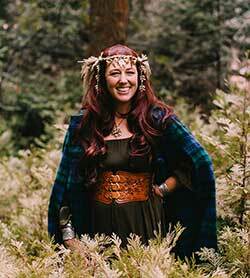 She is very involved in the forest and she can answer any question anyone has about her home. CJ loves to tell the story of the 12 Days of Christmas during the holiday season. In fact, she puts a fun little twist on it and tells the story through several kid-friendly yoga poses. Did you know that CJ Kuffelbug is the keeper of Santa’s magic key? Princess Snowfall was born on an ice cold winter day long ago to King Crispin and Queen Iclyn Frost. Princess Snowfall and her brother, Prince Jack Frost, grew up playing in the cold weather and creating snow. 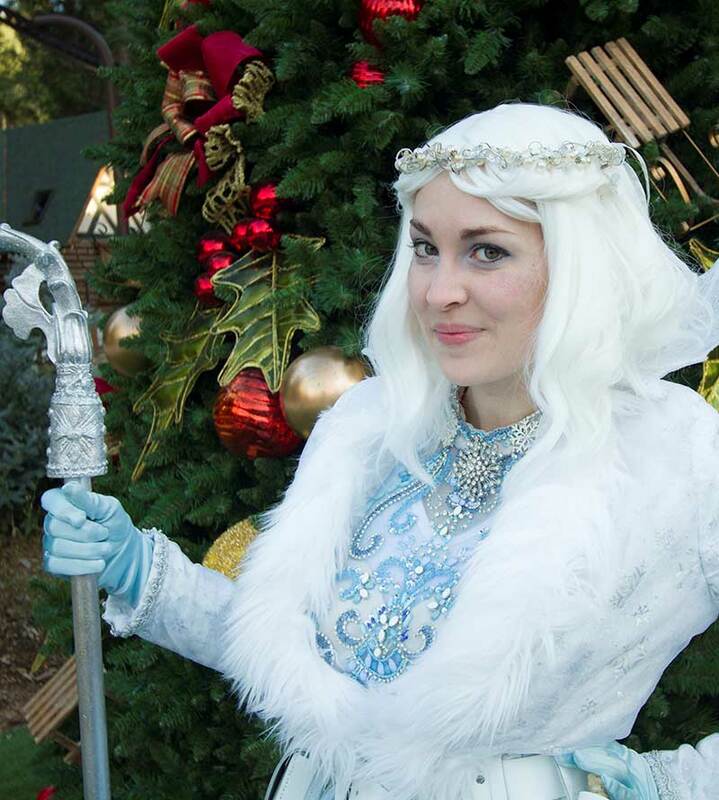 The Queen of Frost taught Princess Snowfall all about the four seasons and how these seasons help the environment. Princess Snowfall’s favorite season to learn about, of course, was Winter. She believed it was the most important because the water from rain and snowfall give life to the plants that give them food. One day, the Queen Iclyn went to the Village to get food for her children. It was a very sunny day and the Queen got much too close to the sun and she melted away. When Princess Snowfall received the news about her mother, she took it very hard. She was very close to her mother. However, in time she became grateful for the time she and her mother had and promised herself that she would do her part in educating everyone in the Northwoods about the four seasons and the importance of snow in the Winter. She makes sure not to come out during the warmer months in fear that she might melt if she gets too close to the sun like her mother. You can find her roaming the Northwoods during the winter. Prince Jack Frost is Princess Snowfall’s mischievous brother. Jack loves to play pranks on everyone in the Northwoods. Did you know he once tried to take Santa’s magic key, captured Father Time in a block of ice and even stole the flavor from Princess Sugar’s candy! Princess Snowfall took the death of their mother, Queen Iclyn Frost and turned it into a life lesson. Jack had a harder time dealing with it. Even though Jack can be a bit pesky at times, everyone in the Northwoods knows that he is still suffering from a broken heart. 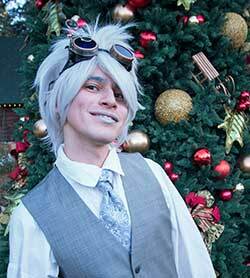 When he isn’t playing pranks on his friends and family, he loves making creations out of snow and ice. Jack and Princess Snowfall can only be found in the Village during the Winter. They have a great fear of going out in the warm weather since they might melt easily. While Princess Snowfall is busy creating snow and educating the residents of the Northwoods, Jack hides away planning out his tricks. One cold winter day, after Santa came home from a long day in the workshop with his elves, Arrow kept dragging Santa outside to play in the snow. It was the first snow of the season and so he followed. Santa also invited some of his Elves to come and play in the snow as well. At first, Arrow, Santa and the Elves wanted to see who could roll the biggest ball of snow. After they rolled three big balls of snow, they stacked them on top of each other. Then, they started looking for things around them, buried in the snow, that they could add to the snowballs to make a snowman. The Elves found some coal in their pockets and placed them on the very top snowball to make a face. Arrow dug up a carrot from Princess Sugar’s garden to make a nose and Santa removed his belt and added it to the snowman. Mrs. Claus then invited Santa, Arrow and the Elves to come inside for dinner. When she opened the door, a gust of wind took a hat and scarf from inside Santa’s House and they flew onto the snowman. The next morning, Frosty the Snowman was alive, dancing around the Village with Twinkles the Tree and Blitzen! 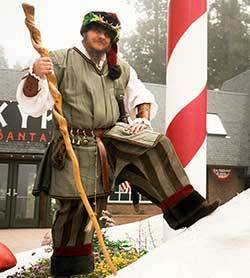 He is now one of the most beloved Northwoods Characters in all of Santa’s Village. 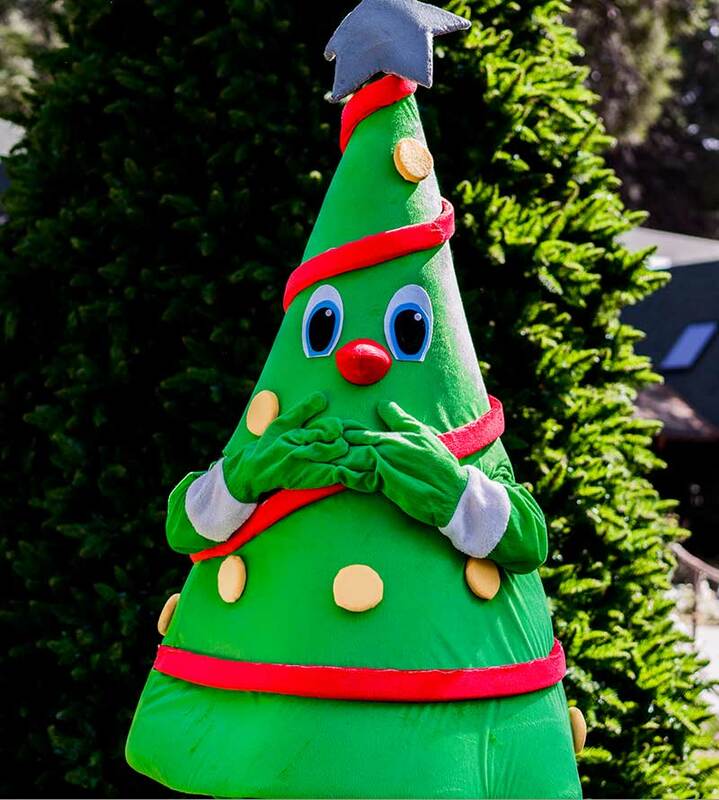 Twinkles the Tree is always the life of the party! 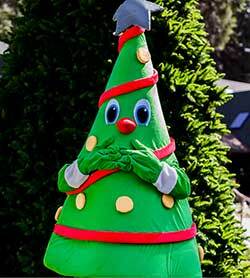 She is Santa Claus’s very own animated Christmas Tree. Twinkle loves to keep Santa and Mrs. Claus company throughout the holidays. He brought Twinkle to life many years ago to light up Santa’s Village and add more holiday spirit to their home. Santa and Mrs. Claus love Twinkle very much. Twinkle is always eager to meet guests in the Village. She also entertains herself by hanging out with her friends Blitzen, Santa’s most trusted reindeer, and Frosty, the Village’s favorite snowman. 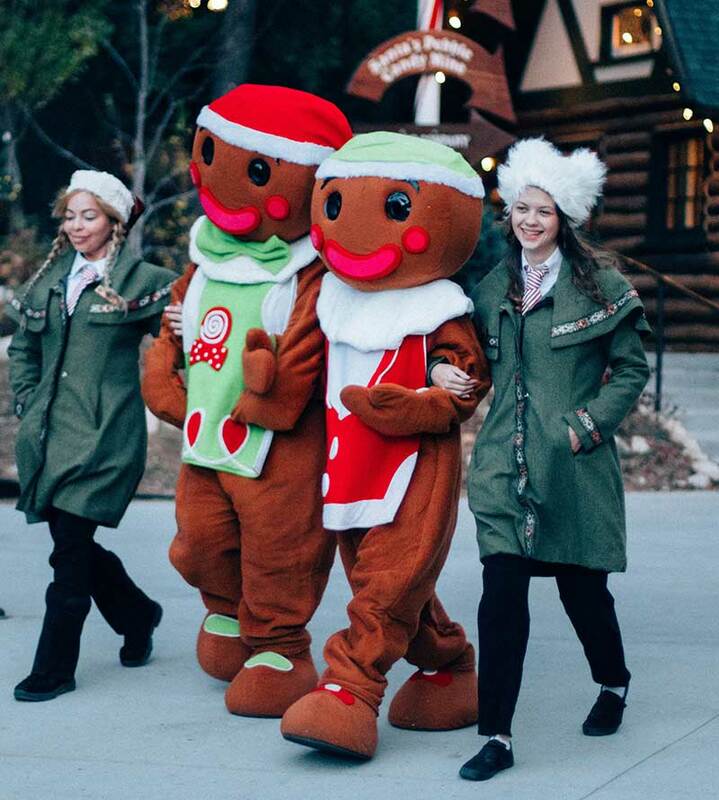 All three of them like to hang out and explore Santa’s Village on their downtime. Twinkle loves to throw parties and attend them too, and everyone in Santa’s Village agrees that she is the most fun to have around! Her favorite thing to do around the Village during the holidays is to attend the lighting of the Village tree, who just so happens to be her father. She waits all year for this event. 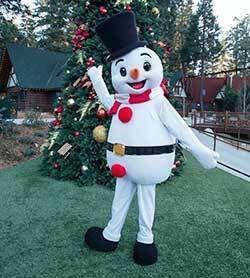 She loves to jingle all around the Village when meeting new guests and they love to sing and dance around her! Make sure you keep a lookout for her, because she’s very hard to find.